Government, Tribal Representatives convene to sign Great Lakes Declaration Nov 23 - Dozens of government officials and Tribal representatives will meet in Chicago on December 3 to sign the Great Lakes Declaration, an agreement to develop a strategy to further protect and restore the Great Lakes. In attendance will be members of President Bush’s cabinet, United States senators and congressmen, state senators and representatives, and Great Lakes governors, Tribes, and mayors. Partnership to reduce global emissions of greenhouse gas Nov 16 - Administrator Leavitt joined representatives from 13 other nations to create the Methane to Markets Partnership, a new global initiative to recover and use the greenhouse gas methane as a valuable clean energy source. Potential annual program reductions could equal the removal of 33 million cars from roadways. 2004 enforcement cuts pollution by one billion pounds Nov 15 - EPA used many different approaches, including helping companies comply with environmental laws, requiring additional pollution controls, promoting environmentally beneficial projects as part of settlements, and filing criminal charges. As a result of activities in 2004, companies will spend a record $4.8 billion reducing pollution. Strong enforcement improves and protects the environment and people's health. Want to receive email with EPA news? Sign up for subjects that interest you. Americans generate nearly 4.5 pounds of trash per person every day - more than 230 million tons per year. The good news is that less and less of it ends up in landfills. Each year, recycling diverts more than 68 million tons of waste away from landfills. You can help by buying recycled products, composting yard waste, and recycling bottles and plastics according to your local recycling program. Visit EPA's Reduce, Reuse Recycle Web site for more recycling basics. Members of the President's Cabinet, the Great Lakes Governors, the Great Lakes Congressional Delegation, Mayors and Tribal Leaders will meet December 3rd in Chicago to forge an intergovernmental partnership and develop a coordinated strategy to further protect and restore the Great Lakes. The Interagency Task Force, chaired by EPA, is helping to convene this meeting to establish a long term, multi-jurisdictional collaboration to address key environmental issues. 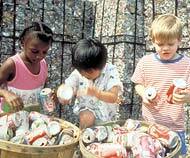 Recycling aluminum cans saves what percent of the energy required to make the same amount of aluminum from raw ore? There are easy things you can do to protect children at home and school. Make sure kids can't reach baits and traps. Store pesticides and other chemicals in a locked cabinet. Never ever put chemicals in containers children could mistake for food or drink.